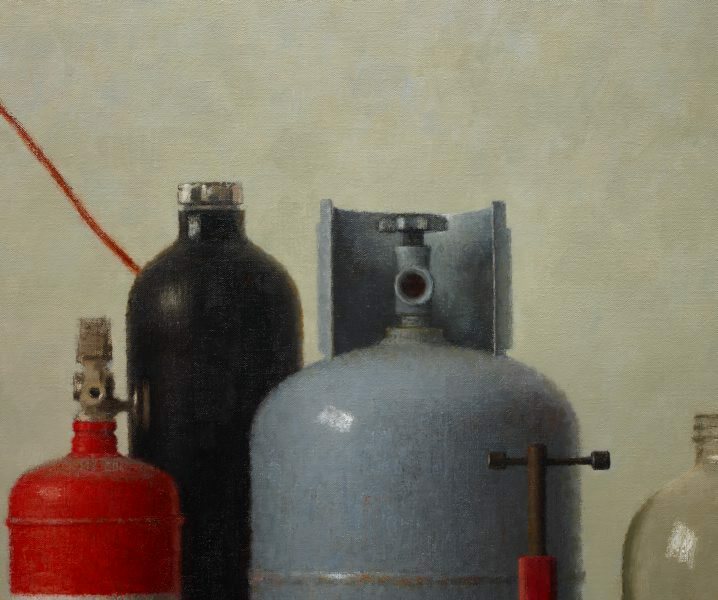 In conjunction with The Bulgari Art Award for contemporary painting, the Gallery has acquired the exceptional still life 'SL359' for our permanent collection. With an exhibition history spanning over 30 years Rae's paintings have been exhibited in Australia, New Zealand, Germany and the USA. While also painting portraits and interiors, Rae is known for her highly refined exploration of the genre of still life painting. Rae's previously minimal depictions of everyday objects have become increasingly rich and complex in recent years. 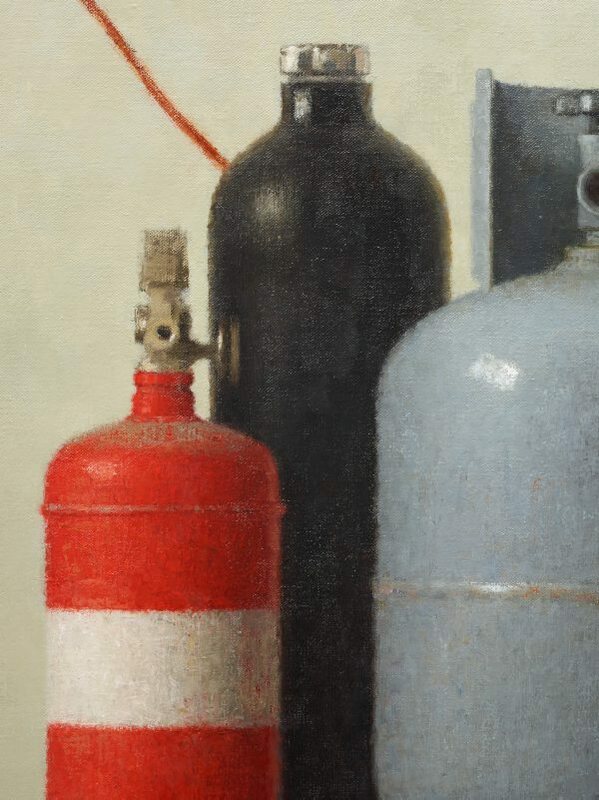 Reflecting the history of still life painting, which reached a zenith in the 17th century, Rae merges this realist tradition within an exploration of formal concerns more often associated with abstraction. 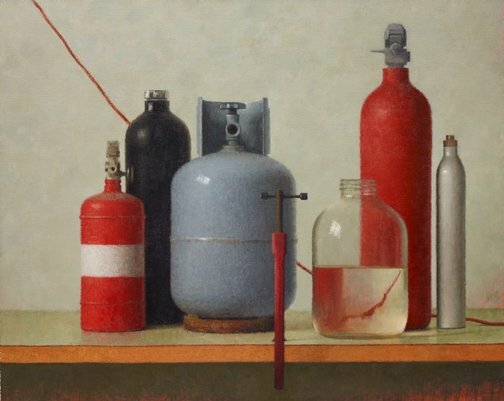 The memento mori symbolism of depicting fruit and flowers in traditional still life to remind us that death is as inevitable as fruit rotting and flowers fading is also present in this painting, but which in contrast depicts discarded industrially manufactured objects including gas cylinders and fire extinguishers. Rae's skilful evocation of the volume, weight and tactility of her modelled forms sits in tension with the flatness of the picture plane. More than simply striking depictions of unlikely objects, they are studies in sensory apprehension, and in this regard Rae sees them as "providing an echo of the complexities and strangeness we edit out of daily life, the flesh and bones of the visual world that we ignore of necessity". Jude Rae is the fifth recipient of the Bulgari Art award which was first launched by Bulgari and the Art Gallery of New South Wales in 2012. Signed and dated u.l. verso on canvas, pencil "Jude Rae 2016/ ...". 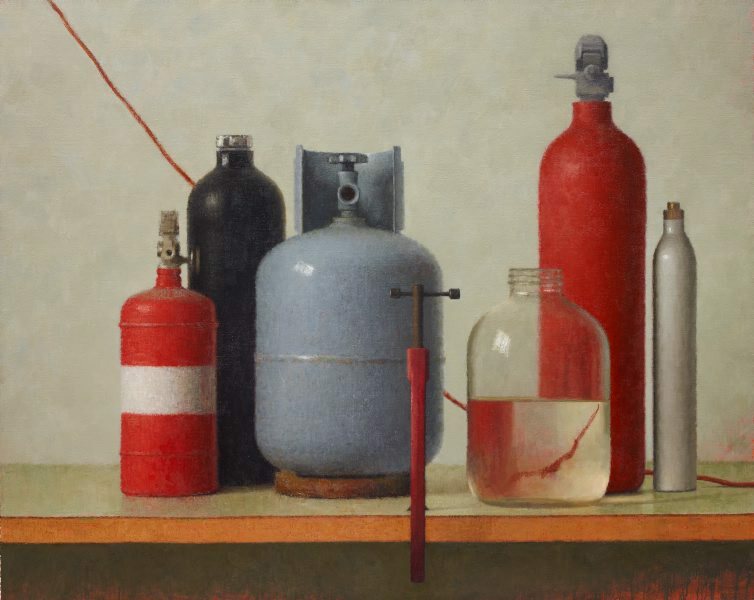 Jessica Sier, Australian Financial Review , 'Slow-burning still life wins Bulgari art prize', pg. 3, Sydney, 29 Apr 2016, 3 (colour illus.). Lucy Stranger, Artist Profile , 'Jude Rae', pg. 74-78, St Leonards, 2017, 74-75 (colour illus. ), 77. Andrew Taylor, Sydney Morning Herald , 'Bulgari-winning artist finds inspiration in unlikely places', pg. 12, Sydney, 29 Apr 2016, 12 (colour illus.). 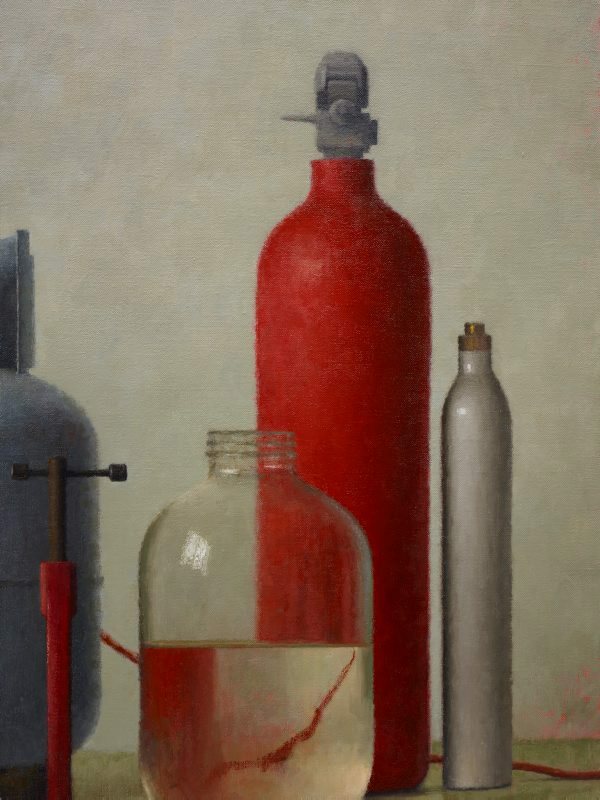 Matthew Westwood, The Australian , 'Capturing resonance in objects', pg. 14, Surry Hills, 29 Apr 2016, 14 (colour illus. ).